Here’s a recipe so ridiculously easy that it’s barely a recipe. But, boy, is it yummy! 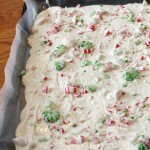 I love the way the vanilla bark mellows out the mints, and the mints add a breezy freshness to the vanilla bark. 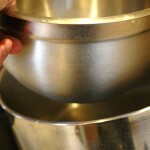 Melt the vanilla bark in a double boiler, or in a metal bowl over a pot containing a few inches of boiling water. 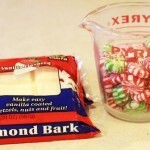 While bark is melting, put peppermints into a ziplock, then put that bag into another ziplock. (Or do like I did and use old bread bags.) 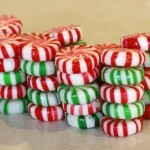 Pound mints with a rolling pin until most of the mints are broken. 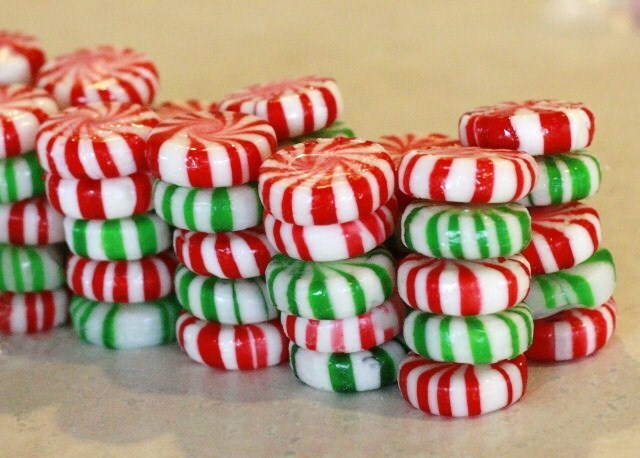 Pour broken mints into a strainer that you’ve set over a bowl. 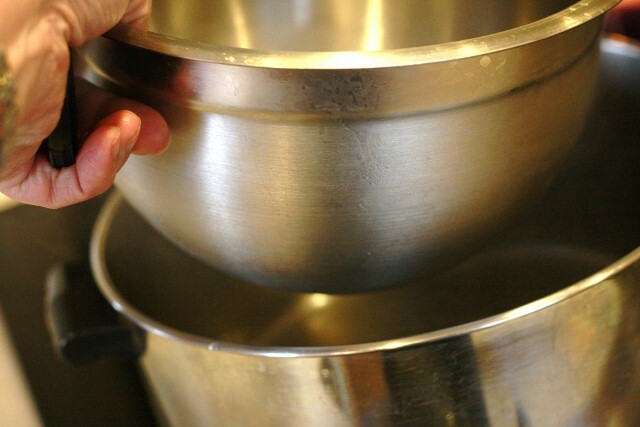 Let the powdered candy sift down through the strainer into the bowl. 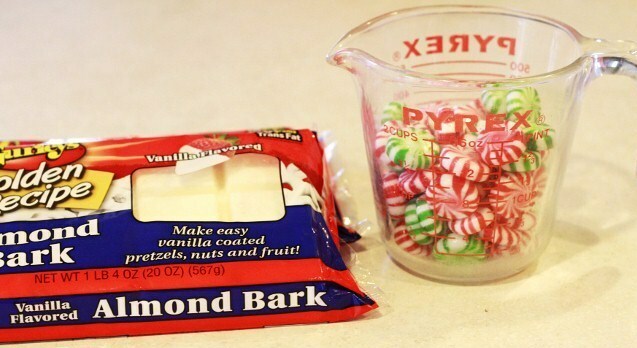 When vanilla bark is melted, mix candy dust and half of the larger mint pieces into the bark. Set aside the rest of the pieces. Put wax paper on two cookie sheets, and butter the wax paper. 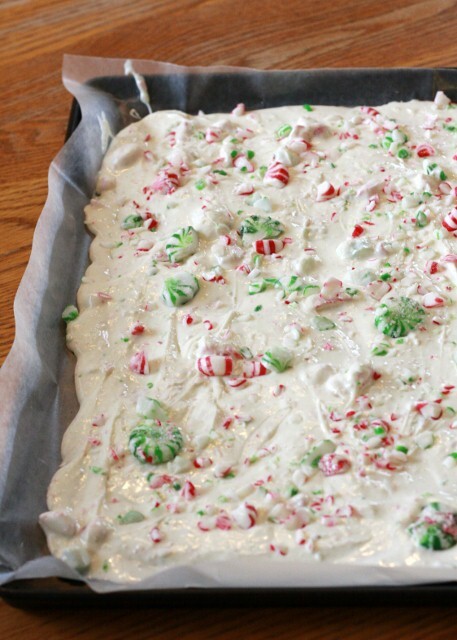 Pour the melted bark/candy combination onto the cookie sheets, dividing equally between the two trays. Spread with a rubber spatula so that the bottom of each cookie sheet is fairly evenly covered. Don’t spread it too thin–the melted bark should be around 1/4 to 1/2 inch deep, though obviously the chunks of candy will prevent you from making it super even. 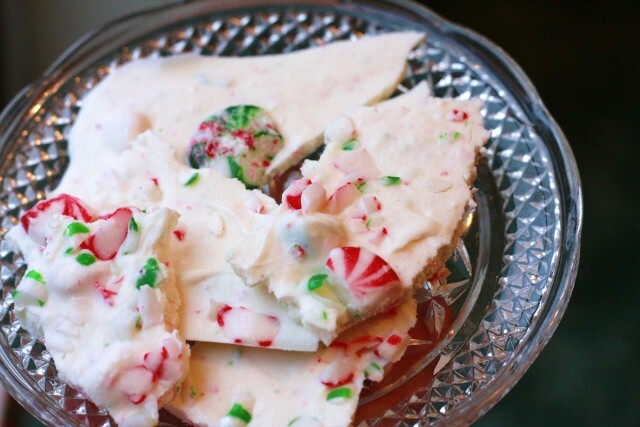 Once it is spread fairly well, sprinkle the remaining candy over the top of the bark, pressing candy gently into the surface of the soft bark. Refrigerate at least 30 minutes, until bark has cooled and hardened. Break into chunks and enjoy! Um… It looks delicious. What is vanilla bark? 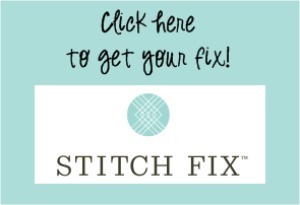 And where do I get some? I’ve been meaning to make peppermint bark for a few years now. Maybe soon. And I love the green mint mixed with the red. Thanks.